DreamHost noticed hosting speed improvements of up to 200% when switching from HDD to SSD. Major providers like DreamHost and InMotion have already made the switch. And as technology continues to advance and decrease in cost, SSD hosting will only become more affordable and widespread. At some point, it will certainly overtake HDD as the standard that all web hosts follow. 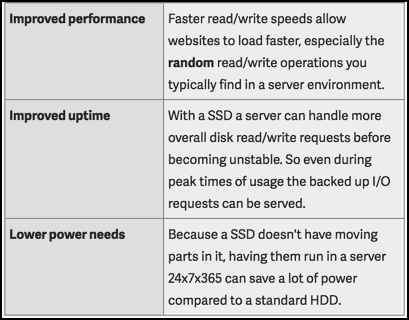 With the affordable SSD hosting options now offered by major web hosts, there’s really no longer any reason to choose HDD hosting. SSD hosting is better in every single way! If you’re interested in an affordable hosting provider who offers SSD hosting, I recommend you consider either DreamHost or InMotion Hosting or SiteGround. Are you using HDD or SDD hosting? If you’re still using HDD, why haven’t you switched yet? Let me know in the comments! 1 SSD vs HDD – What’s the Difference? SSD are the future of storage and soon everyone will start using it. No doubt that SSD’s are way faster than HDD and buying SSD web hosting will be smart move for every blogger. Btw, which SSD web hosting provider do you recommend the most?